Ray Masters has a fascinating bio on his website that includes designing products for companies such as Swatch and creating posters for dozens of sporting events, including numerous Grand Prix races. He now calls Maui his home and has added photography (and running mauiwindcam.com) to his list of talents. 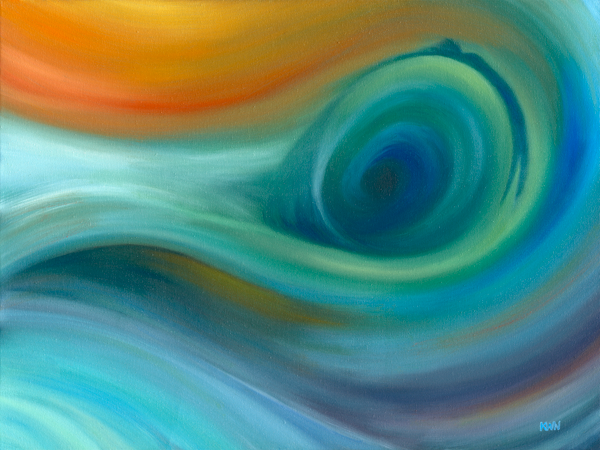 Bodysurfing7.1 is available as an original acrylic on canvas painting, 24” x 18” ($2,500) and a limited edition giclee with gallery wrap ($700). Ray’s new muse, Sevin, was featured in several paintings in the recent ‘Going to the Dogs’ exhibit at the Hui Noeau. 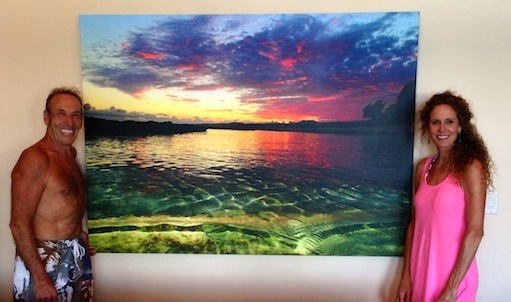 Ray Masters poses with his sunset photography piece, and the lucky new owner! 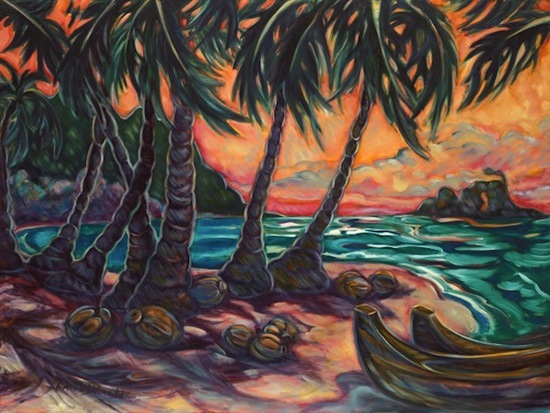 Kim McDonald has earned her comparisons to Gauguin and other “primitive” Impressionists with her lush island paintings, primal flowing seascapes, and dreamy night skies. Known for her oil paintings, which often sell before they are even completed, Kim has recently started painting on an unusual medium, surfboards. Featured in this year’s Maui Calls fundraiser, in galleries on Maui and art shows across the country, Kim’s Warrior Boards are becoming her new must-have pieces for art collectors. Coconut beach is a vailable as a limited-edition print, using the highest quality archival ink on canvas, with a gallery wrap. Prints are hand embellished, signed and numbered. The original has sold. 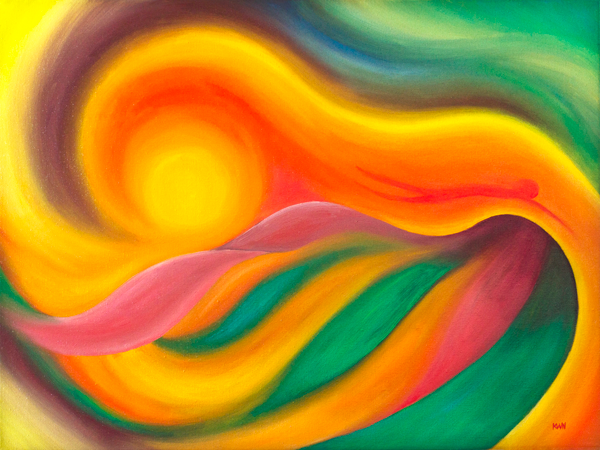 Available as 19” x 25” ($995) or 29” x 38” ($1695). Rick Strini was one of the first artists to revive the age-old tradition of Italian-European glass blowing and bring it to the backyard studio movement of the 60′s. After years of successful achievements in the art glass field, Rick moved into art glass lighting, designing “Art that Illuminates”. In addition to being a master glass blower, Rick has been traveling the world, analyzing glass factories and studios as a glass consultant. If you need something for your walls, your tabletops, or truly unique lighting fixtures, Rick can make it for you. Rick was also just accepted into the Maui Crafts Guild, which will be reopening in Paia next to Milagros any day now! Make sure to stop by to check out his work in person. Another signature Maui artist with a style so unique his works can be instantly identified as his own. Review Avi’s extensive bio here on his website and check out one of his newest works, Hanging Out. Available as a limited edition canvas giclee for $1,500, 40” x 30”. 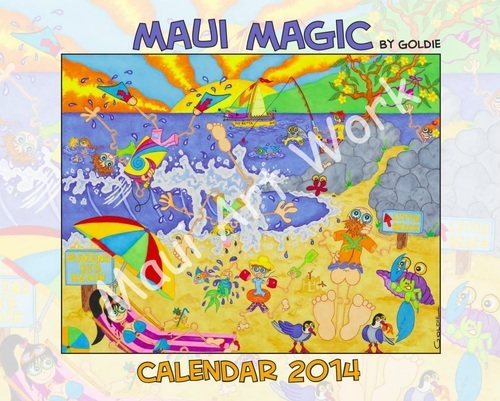 View her website to purchase the calendar and see all of Goldie’s other whimsical pieces, or check them out at Mana Foods, Collections in makawao, Maui Ocean Center, Maui Tropical Plantation, Hi-Tech. When was the last time you went to an art exhibit where bringing kids is encouraged, you can get down on your hands and knees to explore, and even use a power tool if you like? I don’t even know if my words can fully describe how fun and magical the new art exhibit at the Maui Arts and Cultural Center is – but ‘wonder’ is a good place to start. Wes Bruce spent much of his formative youth building forts and structures in the forests of Northern California. Now, as the MACC’s first artist-in-residence, he’s created a fort inside the Schaefer International Gallery, and the name of the installation is ‘Taken by Wonder’. This isn’t your average fort, though. There are secret rooms, tiny nooks, thousands of ‘treasures’, like antique Singer sewing machines and upright pianos… It’s a very sensory experience – with most of the exhibit lit by Christmas lights, hallways with hanging eucalyptus branches which you get a whiff of just as you walk by, and rooms with leather scraps padding the floor… We explored for quite a while and there’s still an upper room that I’m not sure how to access. We’ll have to go back, but that’s part of the fun. With older children, or as adults, make sure you grab a ‘decoder’ paper – there are phrases written all around the fort that you can decode. Outside the fort, the remainder of the gallery space is full of interactive art activities areas – with everything from ‘construct your own fort’ with hammers, screwdrivers, and all sorts of materials, a poem station, water colors, and a tiny tots area with crayons and building blocks. The gallery has NEW HOURS – Tuesday through Sunday, 10 am – 5 pm – and the exhibit runs through November 2. And, if you fall in love with any of the fort’s treasures, you can return during the deconstruction, November 4-7, from 10am to 2pm, to take home a piece or two. Wes’ enduring concept for “Taken By Wonder” has many pulls centralized around the fictional research space of a group of outsiders and the discovery of their existence on an unknown island. There are blurred boundaries and hypothetical concepts alluding to origins, physical and cultural development, biological characteristics, and social customs. Clues within the layers will lead us to believe that the inhabitants have only just left the space, stirring up a curious voyeurism and questioning. Visitors will be free to explore the caverns and chambers of the space, finding artifacts, maps, and remnants of world civilizations, photographs, field samples, illustrations and writings. They will be invited to become part of the response in an interactive mapping room adjacent to the structure, with opportunities to share ideas through mark making and word offerings. This community collaboration will evolve through the duration of the exhibit, with public lectures and education tours facilitated by the artist and gallery staff and will be documented by video and photography. This exhibition is made possible through the generous support of Margaret Raffin. Additional funding provided by the Hawai‘i Tourism Authority and County of Maui, Office of Economic Development. 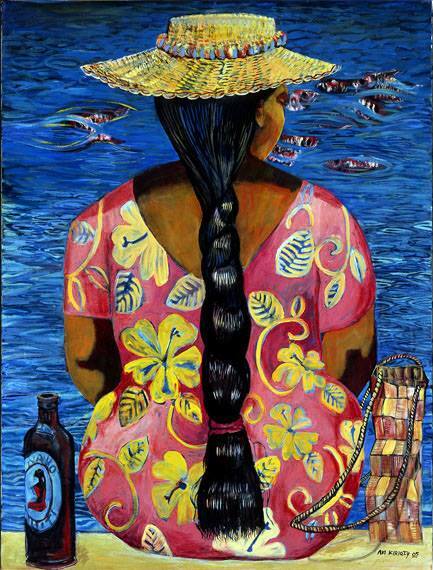 The new art gallery Art Project: Paia presents Women Make The World Go Round, a mixed art exhibition featuring women artists in all forms of expression from Maui and beyond. The group show will feature photography, drawing, ceramics, collage, painting and sculpture. 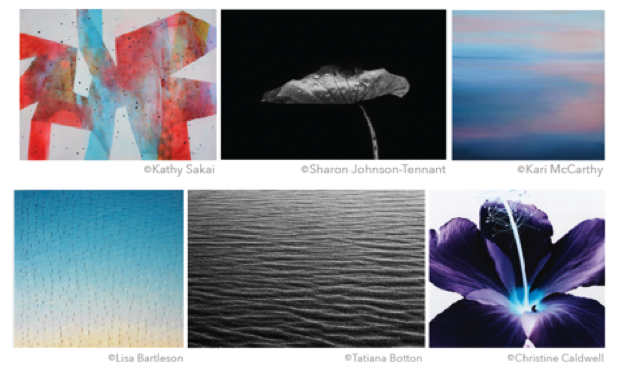 Some of the artists presenting work are: Lisa Bartleson, Heather Boose-Weiss, Tatiana Botton, Christine Caldwell, Sharon Johnson-Tennant, Elizabeth Mauceli, Kari McCarthy, Mallory Morrison, Moye Thompson, Kathy Sakai and Christine Weir. An opening reception for Women Make The World Go Round will be held on Saturday, September 14th, from 4:00–8:00 pm with live music from Cold Without Pants. 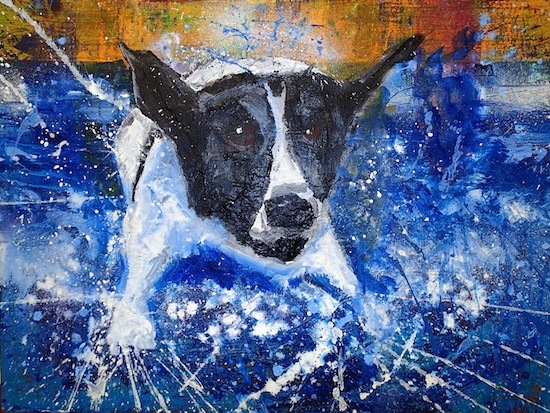 Twenty percent of all proceeds from the reception will benefit the Maui Humane Society. The exhibition will run daily from September 14 – December 22, 2013, from 11am – 5pm daily. Art Project Paia, located at 77 Hana Hwy (Paia, Maui, Hawaii), near Flatbread Co., was founded by Tatiana Botton as a multidisciplinary gallery that offers a fresh and contemporary perspective to the art shown on Maui. Art Project: Paia represents up and coming and established international, mainland and local artists with a distinct Hawaiian sensitivity. Works of photography, painting, collage, drawing, sculpture and ceramics will be presented throughout the year at group shows. A photographer and entrepreneur who divides her time between Southern California and Maui, Tatiana Botton’s wide range of work includes celebrity portraits, print advertising, and sweeping landscapes. Founder of WipFlash and Women Make the World Go Round and owner of Art Project: Paia, Tatiana has won many photography award competitions such as the Advertising Photographers of America, International Photography Awards, Prix de la Photographie de Paris, Women In Photography International, Black and White Spider Awards, and The Photography Master Cup. Photographer Sharon Johnson-Tennant, a self-defined “purist, who doesn’t manipulate, crop or change anything,” presents her stunning “Reflections on Water Lilies.” Kari McCarthy, one of Maui’s preeminent colorists who is “passionate about visual phenomena,” brings to the show her atmospheric and luminous landscapes. Mixed media artist Kathy Sakai, also Maui-based, presents her artistic explorations in color, shape and texture. Christine Weir’s series of airport graphite drawings add geometric elements as well as tiny detailed markings to her subjects, creating fascinating space compositions. Elizabeth Mauceli’s acrylic ink with paper collages explore how physical alteration creates and transforms our experience through abstraction. Christine Caldwell’s mastery of darkroom printing is patent in her “Illuminated Negatives,” dramatic representations of objects found in nature defined by skeletal proportions and emblazoned with neon color. Born in Florida and raised in NYC, Heather Boose-Weiss’s mystical and mysterious self-portrait landscapes, rendered in black and white silver gelatin, explore the relationship between form, presence and place, and what happens in a natural setting when a human enters the scene. Los Angeles-based Mallory Morrison’s imaginary spaces are dreamlike and ethereal. Inspired by her own dreams, Morrison’s waterworld focuses on feelings of being lost and out of control, utilizing weightlessness to tell stories which explore the depths of space and composition. Lisa Bartleson’s abstract light compositions are conceptualized experiments on the pure gradations of color that are mostly influenced by the ambient light she experienced growing up in a small beach community in Washington State. Ceramist Moye Thompson’s connection to the land — to dirt, mud and clay — comes from growing up in a farm in Alabama. Her cigar boxes and wire bottle series combine seemingly contradictory materials like clay, chicken wire, words and definitions cut from dictionaries and found objects of all kinds to create playful and surprising sculptures. While reviewing pictures from this spring’s Maui Open Studio’s event at Maui Tropical Plantation, I was struck by the images of one artist in particular. The more I looked at the paintings by Taryn Alessandro, the more I had to see, until I had checked out each and every painting on her website. But now, I need to see them in person. These aren’t your typical paintings. Taryn, a classically trained artist, has been internationally recognized for her innovative use of upcycled materials and avant-garde approach to traditional fine art. She incorporates aluminum cans, sand, fabrics, glass, cardboard, jewelry and more to create a visual experience unlike any other. Taryn has been featured twice in the annual editions of American Art Collector, has been twice named the Best Local Visual Artist by Maui Time Weekly, was the Official Inaugural Artist of the Wailea Food and Wine Festival, and was named one of the ‘Top 25 Kickstarter Projects’ by Complex Magazine. It all started with the vague idea of a running a “kickstarter” to create a short inspirational film on her process. Little did she realize, Taryn was creating one of the top 25 kickstarters ever, as voted by Complex Magazine. After an overwhelming response & in collaboration with MTVn Producer, Katie Shesh, they recruited filmmakers, sound technicians, & crew to follow Taryn “on the job” for two weeks in Maui and her hometown of Mystic, CT, to capture a glimpse of what Taryn calls “Sensationism”. This exclusive film premiere is the first public viewing of this short documentary. Be prepared to laugh, learn, and get inspired, as you get a intimate view into the life of Taryn’s art. Who: Open to the public – FREE ADMISSION! Taryn was nice enough to take some time from her busy schedule to answer some of our questions! Maui Made: How did you get to Maui? Taryn Alessandro: 5 years ago I flew out to Maui to visit my college (Boston University) girlfriends who had moved here. Much like a lot of people who move here, after 2 weeks, I went home, packed my bags again and came back to live for 6 months…which has now turned into 5 years ;). MM: What is it about Maui that inspires you? TA: I’ve always been intrigued by the ocean- I can never get enough of it. Here I can have it everywhere I look. The expansive views truly make me feel like the world is my oyster- so much to explore. The collection of people here inspires me as well- Nowhere else have I experienced a collective culture with such appreciation for the land and general gratefulness for the opportunity to call this home. People are happy here ;). and lets not forget the obvious- its 80 & sunny everyday….but a brisk cold sunset on the mountains, a walk through a redwood forest, and a rain shower in the jungle are always only a short drive away. MM: Are there any challenges to living on Maui? TA: Um, YES. Lets start with not having an art store, and then move on to shipping. Its near impossible to get supplies shipped here for less than a fortune if at all and even harder when your needed supplies are flammable or heavy… But without challenges we can’t make breakthroughs- When I couldn’t get panels shipped here in the sizes i wanted, i started building my own. Now we’ve perfected our own brand of painting panels and there’s honestly nothing I’d rather paint on- they are perfect for me. Also- when I moved here I had very few painting supplies- which forced me to think outside the box and evolved into me using unconventional materials that were readily available and abundant here- sand, seaglass, driftwood, aluminum tabs, palm fibers, etc. MM: You are from Connecticut, do you miss the seasons? How about the city? TA: I miss the fall on the east coast and the bustle of New York City tremendously. Maui’s geographical location presents another challenge for me- its hard to be able to visit my family and friends as much as I’d like to even just because of how much travel time is involved. I still try and make it back a couple of times a year, and I always take a trip back in the fall for a “fix.” The city is a huge source of inspiration for me- it literally makes my heart beat faster…in a good way 😉 I love that theres a huge eclectic collection of people from all around the world who are there to make things happen- the possibilities are endless. That energy feels even stronger in the fall- it feels like a fresh start ramped with renewed motivation to achieve goals and turn dreams into reality. MM: Where can people view your work in person? TA: The first step is collecting and gathering materials. Every time I see something interesting that I could potentially use in a painting I grab it- sometimes its years before I figure out what for. When I design a composition I often make painting studies, collages, or take a lot of photographs to plan a “blueprint” for my piece. Because I use such a wide variety of materials, its best to have somewhat of a plan before I start to properly plan the layering and each materials compatibility with another. I never have an exact formula for the way I make my originals & I always leave room for experimentation but usually it goes something like this: I sketch out my piece with acrylic paint, then I start integrating the different materials, layer by layer. When adhesives and sculpting pastes, etc are dry and materials are secure and in place, I finish with a refined oil painting. When that is dry I incorporate marine resin to seal it all in. Sometimes I reverse that order ;). MM: What are some of your latest original pieces? MM: And I see that you also offer reproductions – how does that work? TA: They are reproduced as giclees (prints on canvas, or metal) first. Then I recreate each piece by adding back a lot of the mixed materials that make them special- sand, metallic leaf, texture, aluminum tabs, resin, etc. Each piece is unique & slightly different- they truly become originals again. Because they are each re-created with a lot of time and love, I do a very small edition of only 26. Its important for me to do my reproductions this way because my work is so much about texture & light reflection. MM: Which are your most popular limited editions? MM: And you mentioned you make your own panels – what are those made of? TA: Panels are the hard surfaces I build to paint on- the face is usually made with masonite or birch and there’s a deep wood frame so I can continue the painting to the sides, giving them a sculptural effect & allowing the viewer to interact with the piece from all sides instead of just one. I use panels primarily instead of canvas because they offer a more structural support for my collection of materials. I can really “build” my imagery onto them. MM: Where can people meet you? Will you do Maui Open Studios again in 2014? TA: I will be doing Open Studios again, and you can usually find me at Sargents Fine Art on Friday nights from 6-9. MM: Which artists are you inspired by? TA: I am inspired by the expressive and romantic nature of Egon Schiele’s figure drawings and Edgar Degas’ ballerina paintings. Gustav Klimt has influenced the use of gold leaf and pattern in my work, and I have drawn inspiration from Wayne Thibaud and Edward Hopper’s bold colors and use of line. TA: Making more originals! I’ve begun collecting industrial inspired materials for a new experimental series I’m really excited to begin…..they are going to be very sculptural and explore a whole new range of techniques….thats all I will “leak” about that ;). I’ve also been presented with some very exciting opportunities on a national level and some licensing agreements, etc. I try not to predict what exactly will happen and stay open to an infinite realm of possibility, but its always most important to me to nurture my current endeavors first. It’s easy to spread ourselves too thin, and like in any business, a solid foundation is crucial before expanding. Right now my focus is on staying inspired & keeping up with a steady flow of exciting new pieces to provide my collectors and galleries. Mahalo to Taryn, and best of luck at your film premiere- hope everyone can come out and see you this Saturday night! When one has given themselves the task of finding the best Made on Maui products, going onto Etsy can be a somewhat daunting task (and potentially expensive). Just typing in the search word ‘Maui’ leads to 4,894 items (today). So when a shop catches my eye enough to review each and every item in it, I not only start taking notes, but I have to personally contact the owner for an interview. I grew up in New York and got my BFA from Rhode Island School of Design. Then moved back to NY and spent the next 10 or 12 years designing and building interactive exhibits for children’s museums, zoos and aquariums throughout the U.S.
From there, I wound up working as a Project Manager for an International design and engineering firm. My job required extensive travel. Sometimes 3-4 cities a week for 3 months straight. I loved it. But then I got married and hardly saw my husband. I was sent to New Zealand for a couple months-it was amazing except I had only been married for 5 months and my husband was back in NY. I majored in Illustration at RISD and for my thesis project I helped design two exhibits for the Providence Children’s Museum. They needed someone who could create conceptual renderings of what the space would look like and I just happened to walk in at the right time looking for a job. That’s how I wound up with a career in Exhibit Design but I always freelanced on the side. I illustrated some books, magazines, and some exhibits, I had some of my paintings in a few shows here and there, and did some private painting commissions but was never a full time artist until I came to Maui–well I’ve always been an artist but you know what I mean. How did you find yourself on Maui? When I got back to NY after living in New Zealand, I found it impossible to settle. We went through a series of family tragedies and decided we needed to take a break and re-boot. We had never gone on a honeymoon and somehow we wound up selling our possessions, quitting our jobs and traveled around the world for 4 months. We entered back into the U.S. via Oahu and after a week decided to check out Maui. That was February 2012 and we are still here. We had never even been here before. We didn’t know a single person and all we had was a backpack. We lived in a hostel at first and started over here with nothing.The fear of homelessness can be very motivating! Tell me a little about your art? 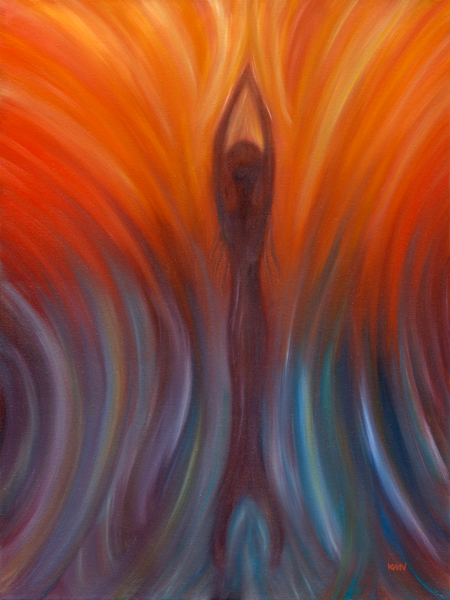 People identify the figures in my paintings as mermaids which is fine but I like to think of them as “free spirits.” I guess my work is very much inspired by my journey. I always incorporate movement and try to evoke the feeling of freeness and weightlessness-that’s why I like to use water as a theme. It’s cleansing and gives you that sense of floating. There’s no identifiable place or time. I imagine it as the space between one life and the next. What inspires you about Maui? Pretty much everything. I’ve always lived near the ocean and love to surf. Now I see the ocean every day except it’s blue and not brown! And there’s whales! And dolphins! and sea turtles! and seals!!! In New York I looked out my window and had a view of a brick wall. Everywhere you turn on Maui, there is an amazing view. There’s so much fresh air and open space, peace and quiet. Pretty much the exact opposite of NYC. After spending much time in 3rd world countries, I’m grateful for so many little things like running water, electricity, my bed. I feel so blessed to have the opportunity to live in such a wonderful place it’s overwhelming sometimes. Every one of my oil paintings I have on Etsy and on my website were done here on Maui in the past year. My work is currently showing at By the Bay gallery in Paia and I sell my illustrations and prints at the Hui2 gallery at the Hui No’eau. I also show my work every 2nd Friday during Town Party night in Lahaina at the Longhi’s Artisan Fair. In the past, I’ve shown in galleries in NY, Providence, Chicago, Portland, and Fort Lauderdale.